We live in a world where food allergies loom large. Tens, even hundreds of millions suffer from intolerances to different kinds of food, ranging from shellfish and eggs to peanuts and milk. Sometimes these allergies represent just mild annoyances, sometimes they can be much more serious. For example, hundreds of people die each year in the United States alone from food allergies, most commonly from anaphylaxis triggered by nuts. The DBV Technologies internet site is where you’ll find the latest on how this French firm is progressing in its work to create a number of different food allergy treatments, including a peanut allergy treatment. Its main platform for these treatments is called the Viaskin patch. 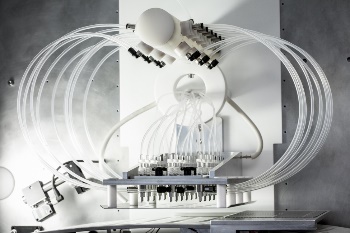 Although the end result looks simple, a whole array of advanced equipment is needed to produce the patch, including the electrospray shown below. The patch’s basic approach involves introducing an antigen into the body through the skin, avoiding direct delivery into the bloodstream, which can be dangerous. This technique can be adapted to different allergies, with egg, cows’ milk protein and house dust mite patches all currently under development. Peut-on vraiment se faire des amis sur les réseaux sociaux ?